Rewind to Saturday the 7th October. It’s 5:23am and I am staying away for the night. I woke up to the sound of FaceTime. It was my wife, and my baby girl calling me for a chat, and to make sure I was a part of the morning routine of singing the “say hello to the sun” song, even though I wasn’t there with them. After the FaceTime, I have my morning cup of tea and, I’m both more nervous, and more excited than usual. 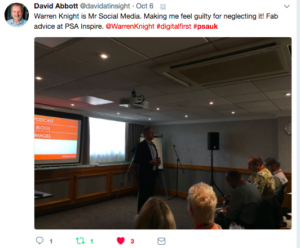 My energy levels are heightened and it’s all because I was in a hotel in Coventry, and it’s the first day of the Professional Speaking Associations (PSA) once-a-year conference. This year, it was called “Inspire”. I remember when the call came in from this years president; Lee Jackson. After a quick chat, we very quickly realised that our love for hip-hop and old skool tunes (Lee being a DJ back in the day, and me; as a former hip-hop dancer) gave us something great; common ground. We both soon realised that it would be a good fit for me to be a part of their “Inspire” event. 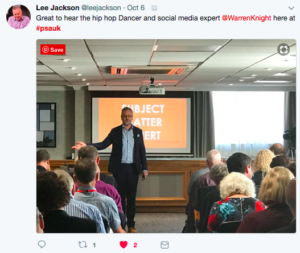 Lee offered me the opportunity to speak in front of a group of professional speakers, and share exactly how speakers can build relationships with speaker bookers through the use of Social Media and ultimately, win more speaking gigs. I then realised what I had let myself in for. This took me back to 10 years ago when I first spoke on stage, and whilst that was an emotional experience, I very quickly realised that professional public speaking was going to be something I will not only do for the rest of my life, but LOVE doing for the rest of my life. The years following my first speaking experience were great, and I took every opportunity to speak to an audience in professional public speaking capacity (sometimes as few as ten people, and other times hundreds of people) even if it did mean that 90% of the time, I was doing this for free. Why for free? To gain experience. Throughout this time, I jumped at the opportunity to speak abroad. I wanted to challenge myself, and fine-tune my message, pace and presentations. Overcoming difficulties like speaking to an audience whose first language was not english meant that I had to be as clear, and concise as possible. I wanted to make sure that every person who came to a talk of mine could still understand, and take away what was important to their business. If this was achieved, I knew that I could have a career in professional public speaking. 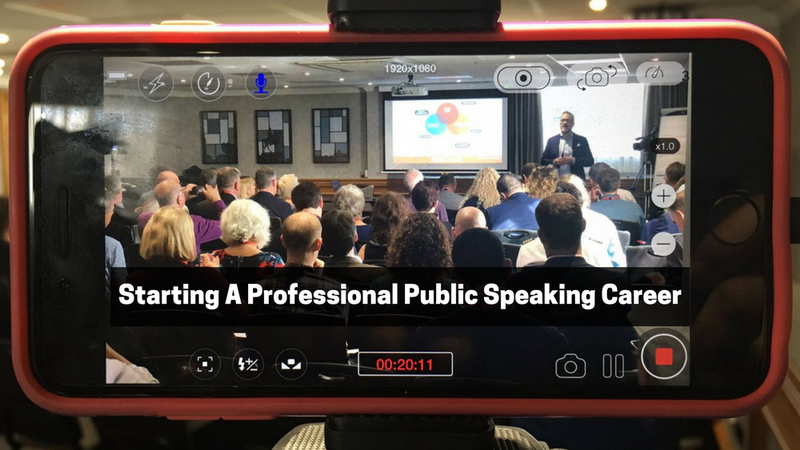 After working with a business coach to help me understand the “business of professional public speaking” and speaking with professional speakers, I soon realised that very few speakers around the world made a full-time living from just professional speaking. Every single speaker had other income sources (as I like to call it; “revenue streams”) coming into their business. 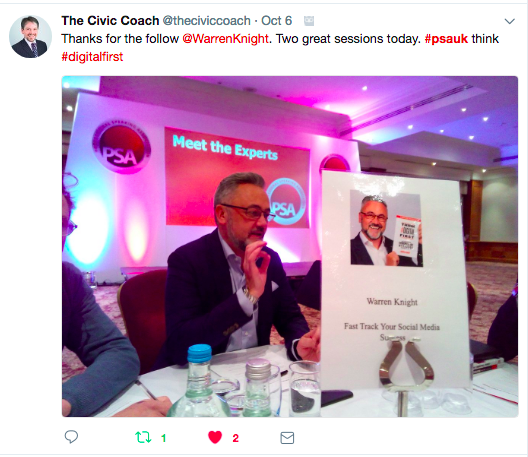 In 2014 (just three short years ago) I decided to turn my speaking at events into a revenue stream, and position myself as an expert in the industry of as professional public speaking. 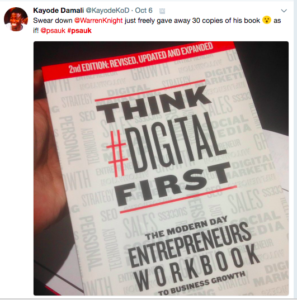 Along with this, I wrote my first physical book, and with the help of two very different style coaches, I fine-tuned my own, individual style and hired an extra team member to actively look at (and manage) being paid to speak at events on a monthly basis. Back to 5:47am on the 7th October. I am now awake in my hotel room in Coventry, with a massive smile on my face after singing with my little girl for exactly three minutes and six seconds. 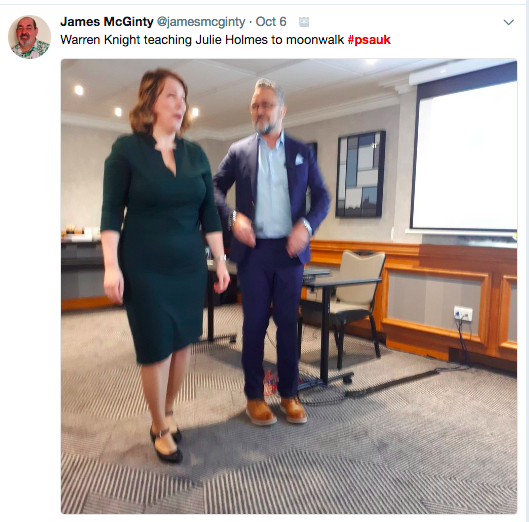 I was three minutes into my talk and I stopped and asked the audience if they would like to see Julie Holmes (a speaker from the previous day who spoke about knowing and sharing the why and how you can be different and the benefits of being unique) do the moonwalk. Before this moment, she had no idea what was about to happen. 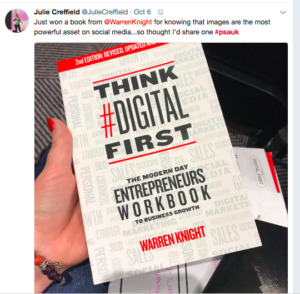 The room erupted and Julie walked onto the stage with a massive smile on her face, and in her American accent she said four words I was hoping to hear… “ok… let’s do this”. 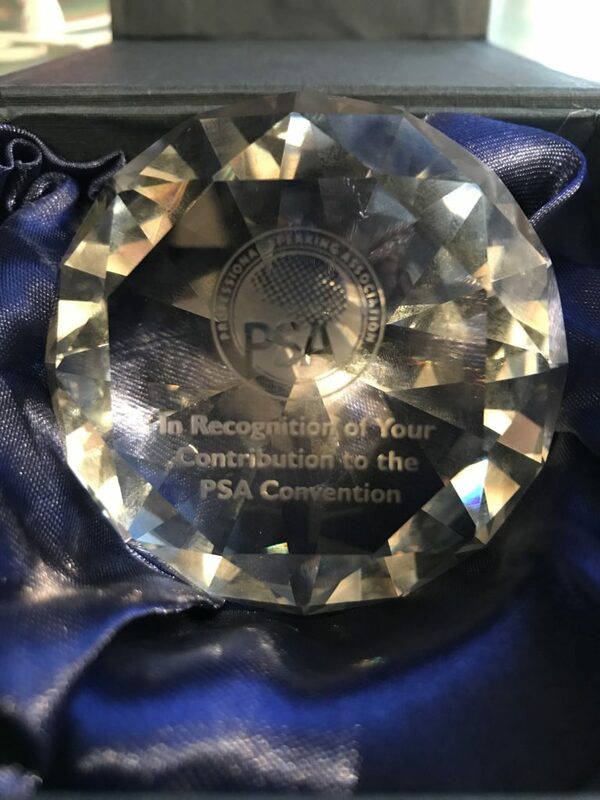 At the end of my talk I was amazed (and pleased) at the response and was very kindly offered a gift from the PSA. 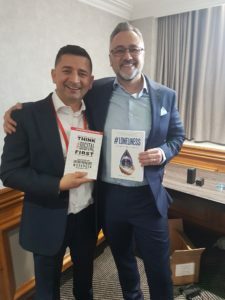 Part of helping individuals to keep learning after my talk came with an offer of giving every person in the room a copy of my book (now in its second edition) and in return, I had a few pictures with some amazing individuals (thanks for your book #Loneliness Tony Jeton). I was also amazed at the response on Twitter of people taking pictures, and videos and sharing what they had learnt. This was a great way to show how “earned media” (in other words, media about you but not published by you) is one of the best ways to market yourself through a happy and engaged audience. The rest of the day was great, and again, I was given the opportunity to speak to over speakers on a 1-1 basis in a “meet the expert” session. I just want to share with three simple things (or what I like to call “KISS”; keep it super simple) I want you to take away from this article on becoming a professional speaker. Become an expert in a specific subject matter, and stay laser-focused on this. Speak where you can, and make sure it is always to your target audience and get feedback so you can continue to learn, and grow as a speaker. Make professional speaking a part of your business model and treat it the same way as you would when looking at working with a new client. I’d love to hear your stories of how you have become a professional speaker and made this a part (and not just an extension) of your business. 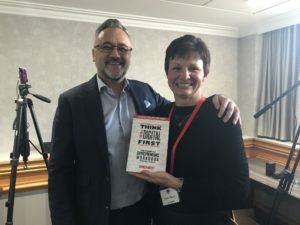 It was a pleasure meeting you at the @PSAUK Inspire Event. Thank you for the mention and the book which I am taking with me on my trip to coach a client in Brazil. I started speaking to an audience back in 2000 without realizing I was a speaker. Back then it was part of my IT job to speak every month in front of board of directors and Goverment officials. In fact this article inspired me to write one myself. I look forward to sharing a stage together. Thanks for sharing Tony and I’m pleased it inspired you.